I have a small zip lock bag full of left overs of my handpun llama fiber. There’s less yarn in those balls than you might think as I remember having wound the thread around clay beads. What to do with them? For me, combining them all into one project won’t work as I don’t feel I have enough dark colored thread to create a decent amount of contrast. 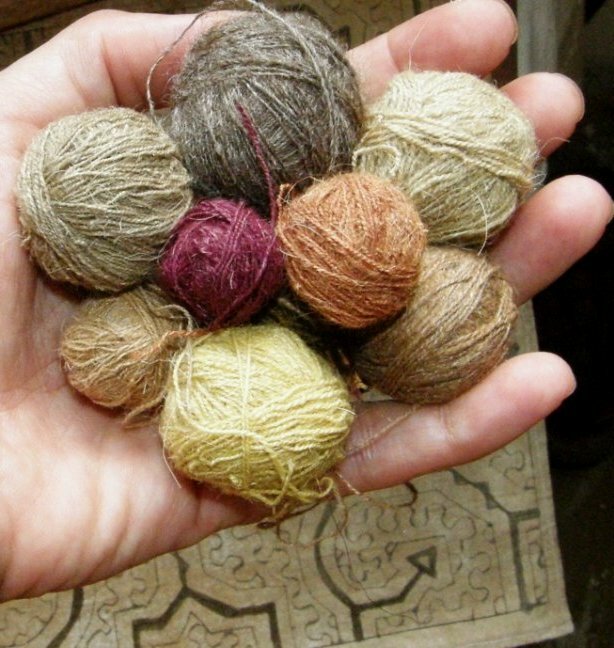 Maybe I could darken some of the colors by over-dyeing with tea, or I could come up with some small projects to weave using just two or three colors. Aren’t these gorgeous?! When I first saw these pictures I longed to try making a cuff with my own handpsun and edging it with a tubular band. Then I got distracted and carried away with other projects. I did make cuffs in the end…several of them, in fact…but in silk without tubular edgings. Now I could finally get around to trying this with my handspun. The reason I was looking for small projects like these is that I really needed frequent breaks from tying plastic strips around warp threads for my latest ikat experiment. 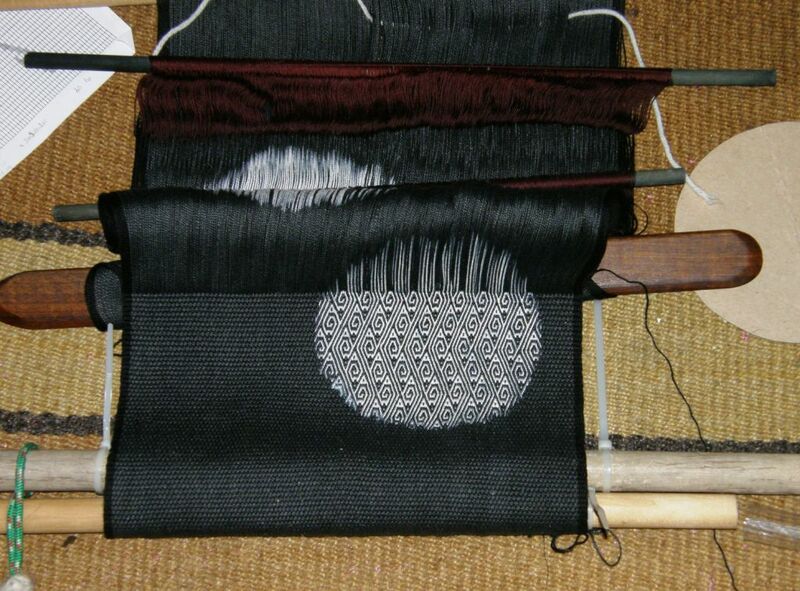 I like to be able to weave every day. Even taking a whole day off from warp tying was most welcome…talk about tedious! So, it was very nice to be able to take a break and pick up a small project and weave away. Here’s the second cuff I made which is the one with which I am most pleased. 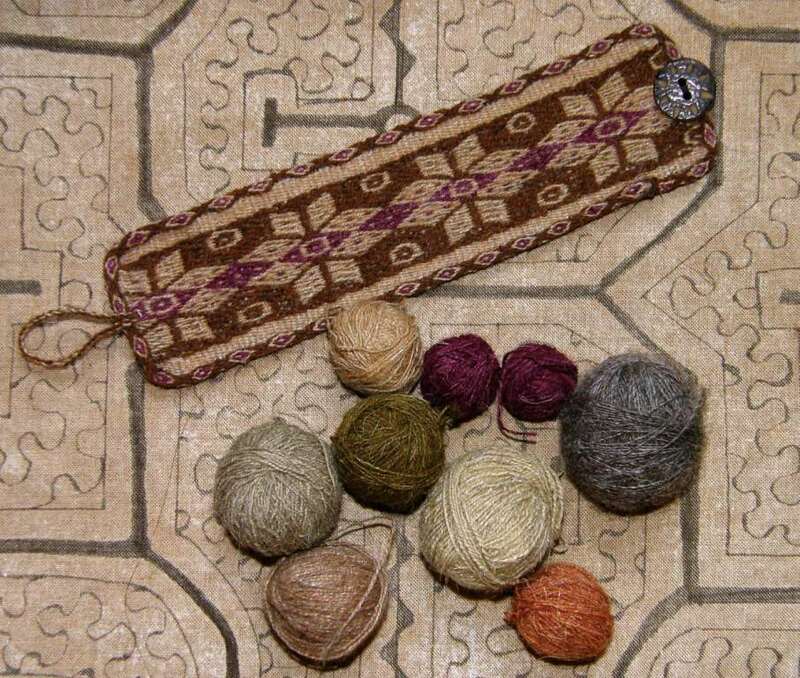 I used the Tinkipaya star pattern that I recently used on a wool bag project. That’s the first one I made on the right. It’s a little rough and I wish I had put more thought into the layout. The pick-up pattern in the center would have looked better if it hadn’t been bordered by red, I think. I guess I wasn’t very confident about it being a success and was a little careless as a result. Both are edged with tubular bands. 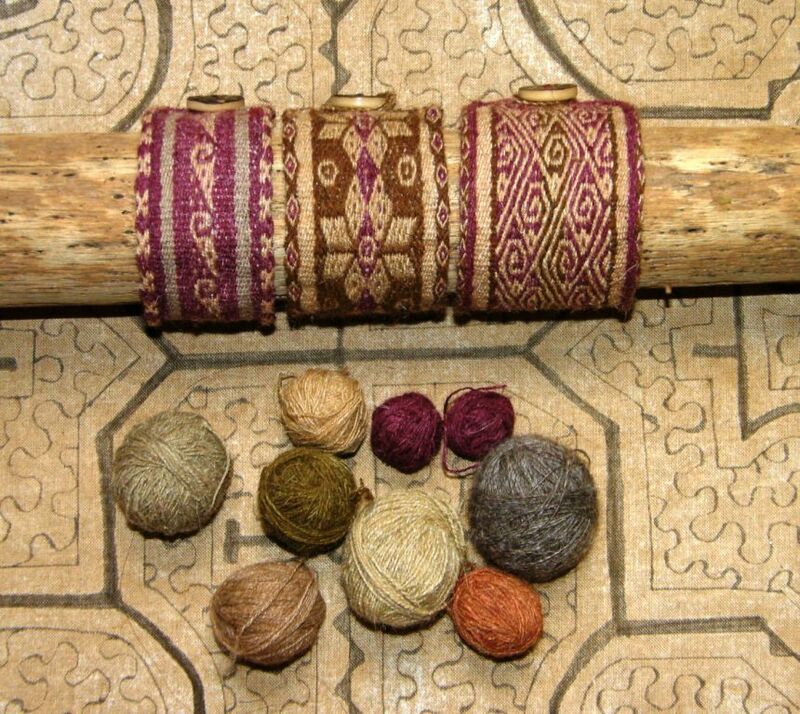 The red one has an X and O pattern that I saw being used for a tubular band by a weaver in Pitumarca, Peru. The other has the eye pattern that I learned in Chinchero, Peru. 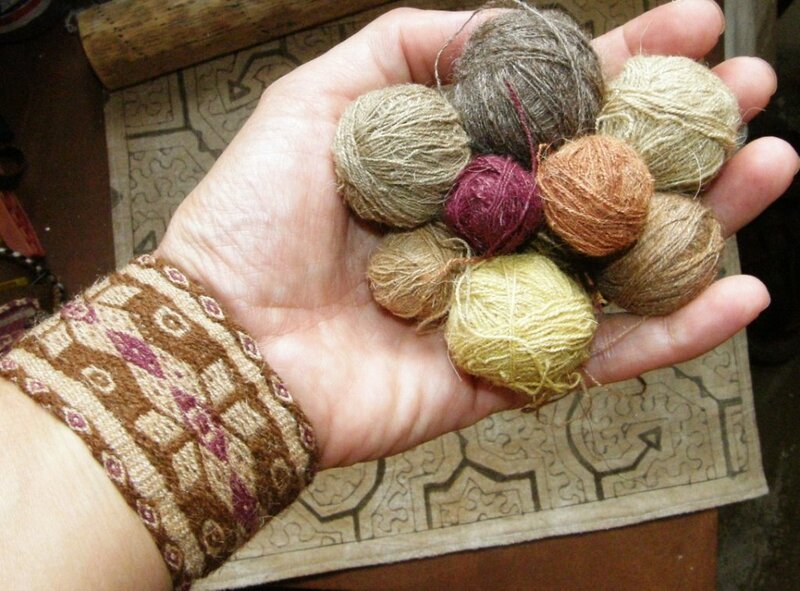 I didn’t manage to make any sweet yarn buttons like the Peruvian weavers have in their beautiful cuffs. I used buttons made from tagua nut that I had bought in Ecuador many years ago. One end of the cuffs that I wove is a selvedge and the other end is raw. I turned the raw edge over, sewed it down and then stiffened it with diluted white glue. This enabled me to then securely apply the tubular edging. I wove and sewed it to the edge at the same time. The tubular band does a pretty good job of covering that turned edge. As always with these tubular bands, you can start with a selvedge but then have to get creative with the finish where you are left with a bunch of unwoven warp ends to somehow hide away. When edging a bag, this is easy. All sorts of things can be hidden on the inside of a bag. You can see the place where the end of the tubular band meets the beginning in the picture above. Like I said, you just have to get creative. If you can’t see it, that means that I did a pretty good job ;-). Of course, I had already woven three cuffs before I realized that it would have been wise to position and hide the join in the tubular band under the button! Forehead Slap #1. A braid at one end of the cuff loops over the button to secure it around my wrist. I made three and each is edged with a different tubular band. The third has the Chauaytire style of tubular edging. The pattern does not show up so well due to the lack of strong contrast in the colors. 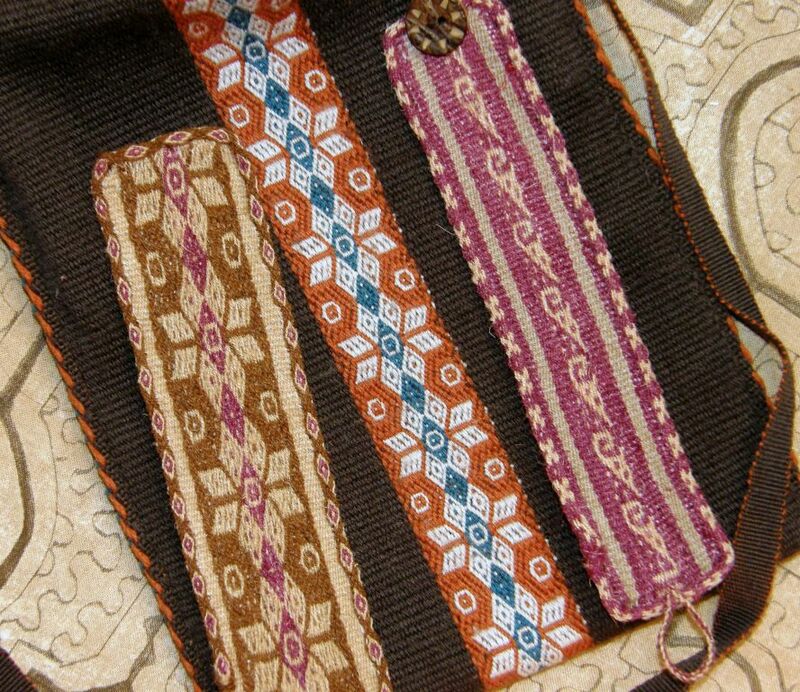 The third one has a pattern that I adapted from a belt made by the Tarahumara weavers of Mexico. So, the cuff weaving was a welcome distraction that got me through the tiresome process of applying ikat ties on my larger project. I have seen pictures of young ladies in Uzbekistan seated around a horizontal frame and tying bundles of warp together for ikat. It could be fun as a group activity. 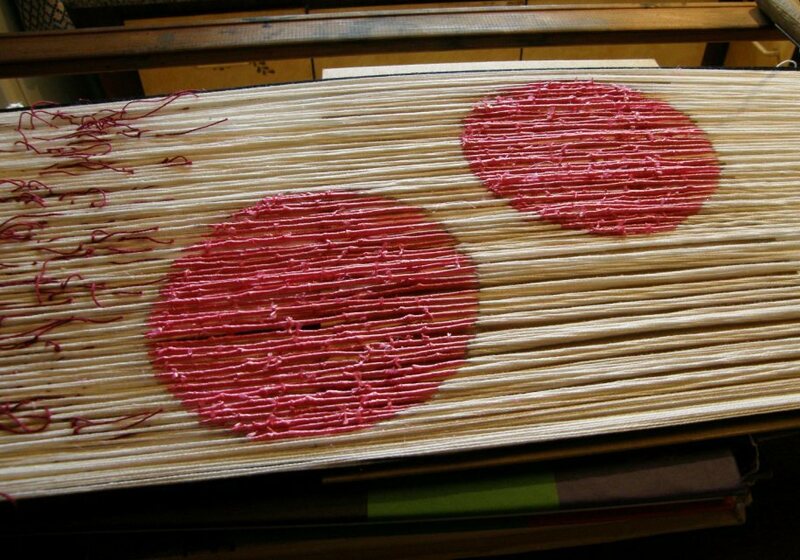 It doesn’t really require concentration if the design has been already marked on the warp threads. I had originally intended having four circles on this warp….two on the front of what will hopefully be a slip cover for my laptop and two on the back. But, after two, I was done! I am still in the experimental stage and I figured I could learn plenty from just two circles…and indeed, I did. I already have new strategies planned for the next attempt. One of the big lessons…Forehead Slap #2…is that the original tied shape will contract considerably lengthwise if it is being filled with patterning. So, I have a squat circle underway. You can see my original cardboard template on the floor nearby. I hadn’t even noticed this happening when I wove the block-like patterns in my Bird ikat project. However, I don’t mind this squat circle too much. But, one of the best things I learned this week was the value of having time to let my mind wander freely. This is probably why I seem to solve all my weaving problems when in the shower! When traveling, I have plenty of time to do that…all the airport waiting time and bus trips give me lots of opportunities to let my mind wander and I get my best ideas that way. Once I am home, I spend all my time implementing those ideas, very focused and concentrating on pick-up patterns….a wandering mind leads to mistakes. All the time I spent standing at the ikat frame and a few hours spent sitting at the doctor’s office this week (where I was surprised to find that I was the only one without an electronic device) have allowed my wandering mind to bring me a whole new set of fresh ideas. I am going to leave you this week with a couple of videos. The first is a 14-year old Peruvian girl singing Michael Jackson’s The Way You Make Me Feel in Quechua. I love it! This was produced as an effort to promote young people’s pride in their native Quechua language. A word of warning…I have had this song in my head for the last three days. This second video was produced in Argentina and the song is about Doña Ubenza who, according to this web page, is a shepherdess who spins while she tends her grazing sheep. Inspired by the spinning and sheep, the producer applies the fiber theme to stop motion animation with felt figures to tell the story. It is adorable as is the song itself. Unfortunately, Doña Ubenza is not spinning in the video but you can see here there with her sheep. Laverne, the Ikat is stunning! It brings Japanese Sumi-e to mind. I also enjoyed the two videos, especially the stop action animation. Thanks, Laverne. I always enjoy reading your inspiring posts! 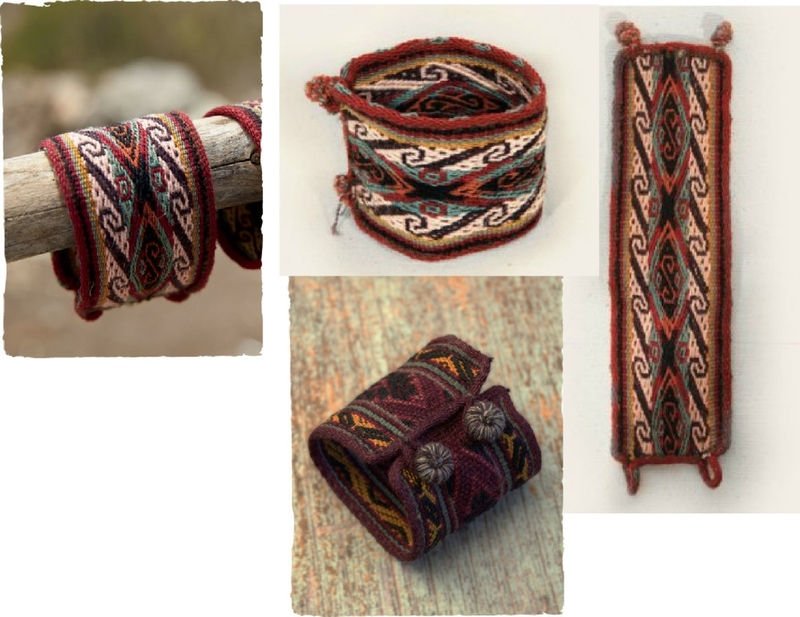 gorgeous wristbands and the Ikat is stunning! I love the videos! Sending you a big hug, Anna. I love your cuffs! 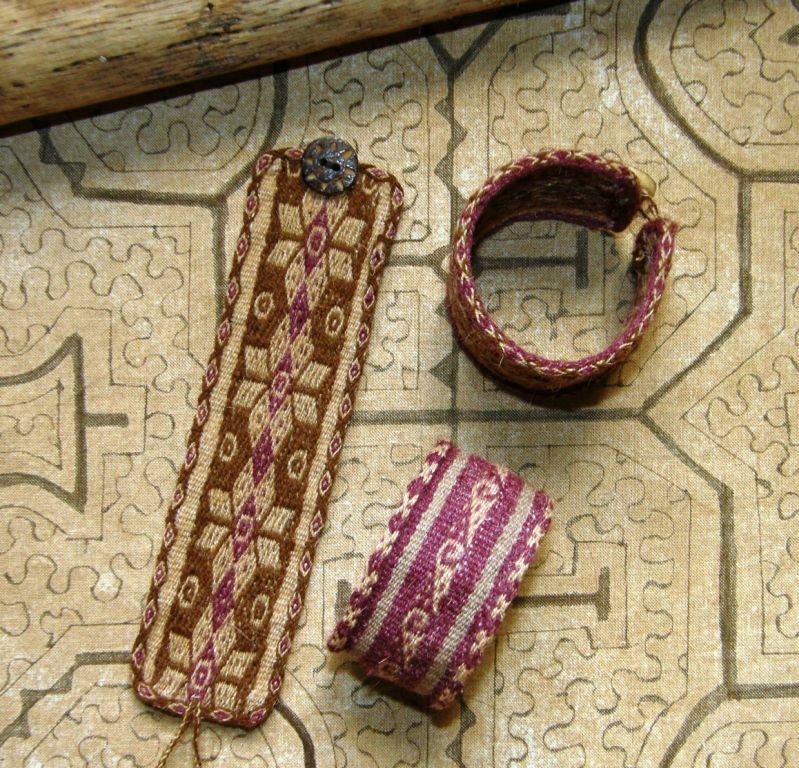 The title of your post got me thinking about how it would be fun to make bracelet cuffs of woven scraps using a slap bracelet core… that’s a thought I’m going to file away for later! Yes, that IS a great idea. I hope you use it and let me know how it goes.